This patient was treated with ClosureFast radiofrequency ablation of the great saphenous vein only. 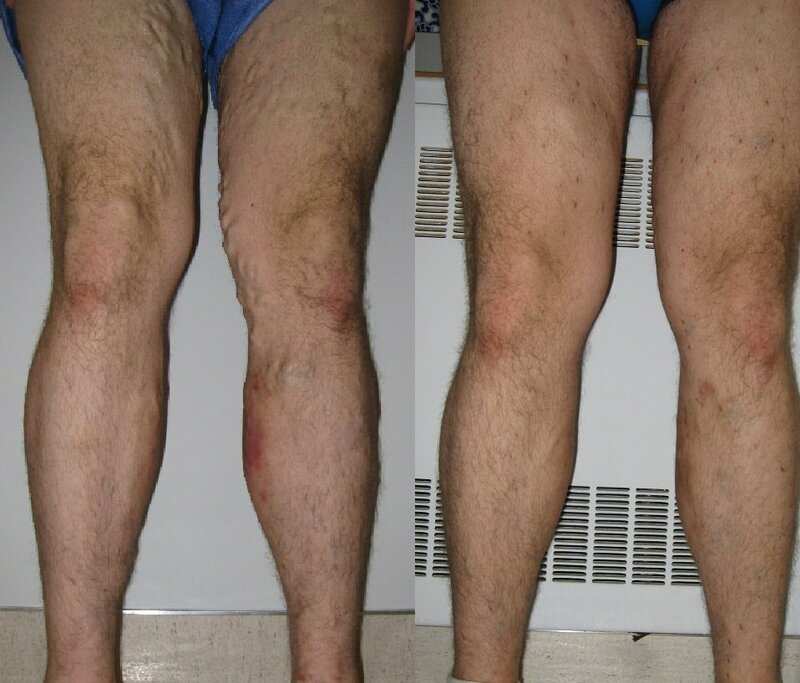 No vein excisions or sclerotherapy were needed. The patient is shown 3 months after treatment. This shows the value of staging treatment and not rushing to do unnecessary procedures. 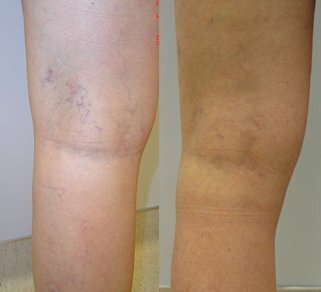 This patient was treated with ClosureFast radiofrequency ablation of the great saphenous vein and sclerotherapy of the large varicose vein. No vein excisions were needed. The patient is shown 3 months after treatment. Again this shows the value of staging treatment and not rushing to do unnecessary procedures. 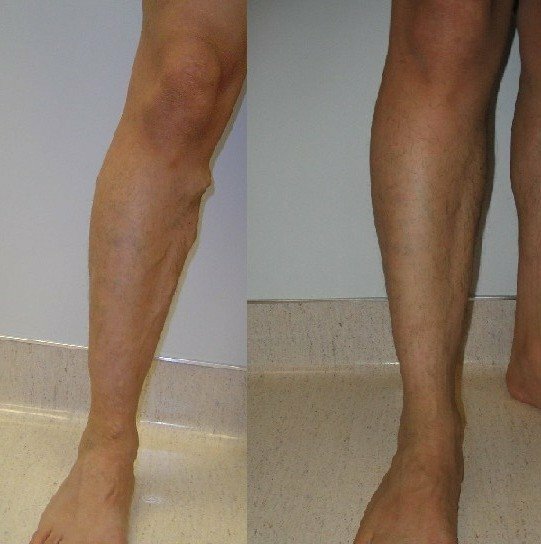 Only six weeks after great saphenous vein ablation by the ClosureFast method, the veins of the posterior medial leg are markedly reduced in size. 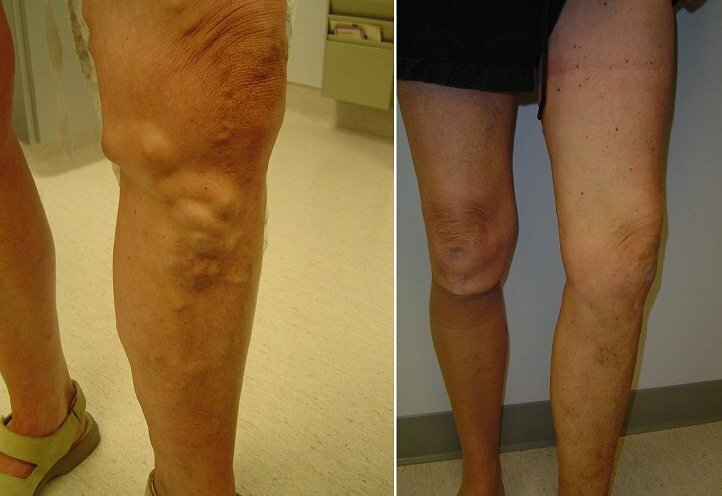 No additional procedures such as vein excisions or sclerotherapy were needed. This patient was treated with ClosureFast radiofrequency ablation of the left great saphenous vein. After a period of observation, this was followed by excision of the large varicose veins (microstab phlebotomy), since they did not completely respond to saphenous vein ablation alone. Microstab phlebotomy after ClosureFast vein ablation is not required in the majority of patients. The treatment principle at the Alaska Vein Clinic is to stage procedures and not perform vein excisions that are not needed. 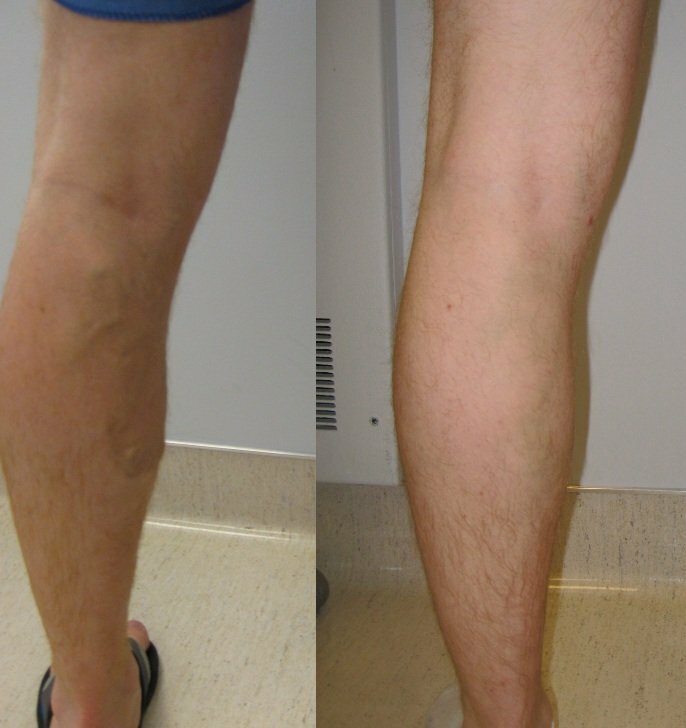 This patient was treated with ClosureFast radiofrequency of the great saphenous vein alone. This is 6 weeks after treatment. No additional procedures were needed. This patient is a driver/deliverer for a major package express company who came to the AVC with painful legs, pigmentation, and venous stasis dermatitis (skin inflammation) to the inside of the left leg just below the knee. He was having a hard time performing the tasks his job requires. He was treated with bilateral ClosureFast saphenous vein ablation that was followed by microstab phlebectomy. The patient is shown 4 weeks after the microstab phlebotomy. The dermatitis has resolved. The small vein excision scars will fade in time and will become almost unnoticeable. Most likely he will always have some residual staining of the inside of the left leg just below the knee, but it should lighten as time goes by. 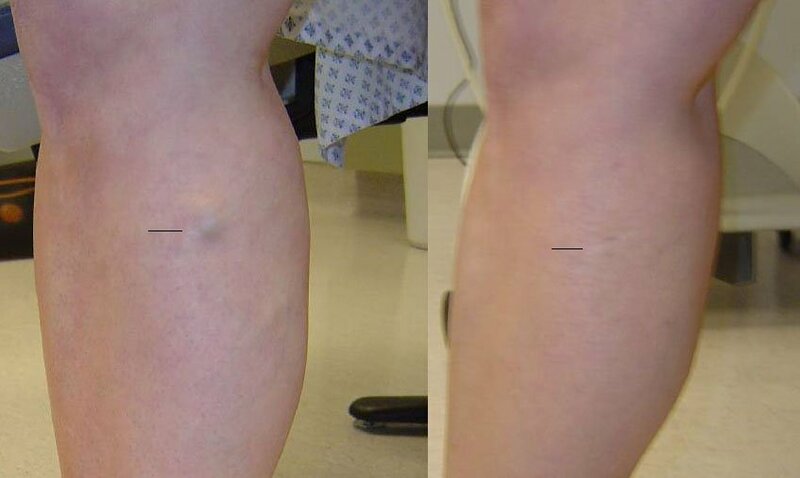 Patient 12 weeks after sclerotherapy to cluster of varicose veins behind upper aspect of lateral posterior knee area. 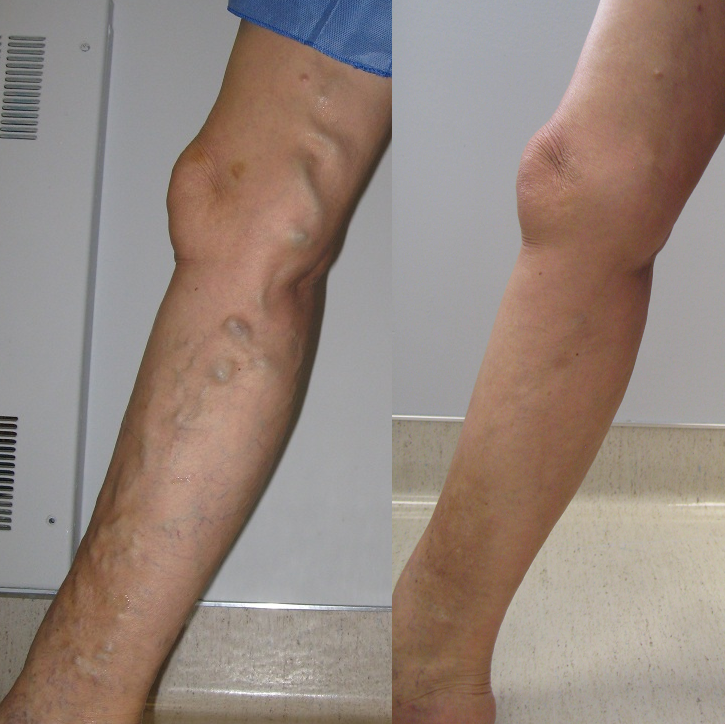 This patient had a varicose vein excised at another vein center. The dark line points to the scar made by the excision. This painful vein recurred several years later because the underlying perforator vein was not addressed. 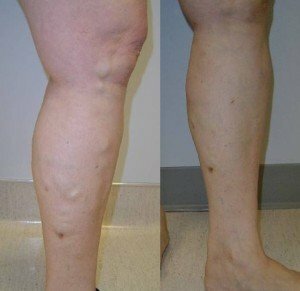 At the Alaska Vein Clinic, the vein and the underlying incompetent perforator were treated with ultrasound guided sclerotherapy with excellent results. This shows again, that excision of varicose veins should be a procedure of last resort. 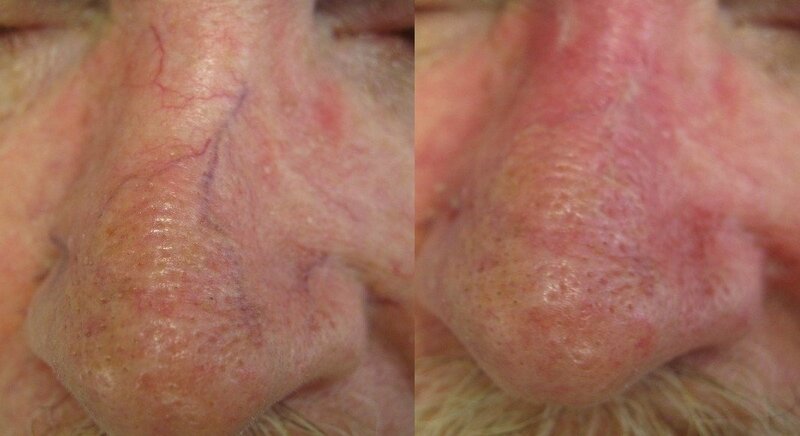 This patient came to the Alaska Vein Clinic because he was concerned that people focused on his veiny nose. This problem was treated with VeinGogh ohmic thermolysis in one visit. This is advanced venous insufficiency with pigmentation and scarring (lipodermatosclerosis) and non-healing ulceration. Before coming to the Alaska Vein Clinic, this patient was treated with $100,000 worth of hyperbaric oxygen therapy without effect. This patient did not have an oxygen delivery problem (she was young and healthy with excellent arterial blood supply. She had a vein problem. The middle picture is 3 months after treatment and the far right picture is 2 years after treatment by ClosureFast and Ultrasound Guided Sclerotherapy. The pigmentation will continue to fade as the years go by, but it will never go away completely.